Former commanders of the Papua New Guinea Defence Force say Australia is partly to blame for discipline problems with PNG's soldiers. Their organisation, the PNG Flag Officers League, made the comments after a group of more than 30 soldiers armed with bush knives, iron bars and firearms attacked students from the University of PNG Medical School at the weekend. The organisation's spokesman, General Jerry Singirok, told Radio Australia's Pacific Beat program they think discipline problems stem from surplus of soldiers that Australia should have helped resettle into civilian life in the late 1990s. "The Australian Government is as libel as successive PNG governments because they committed the Australian government in particpating and assisting financially, including provisions of transport and logistics to repatriate solders based on the eminent persons group report," he said. General Singirok says the actions of soldiers of the 1st Royal Pacific Islanders Regiment is barbaric, and they shouldn't get away with it. "(It) warrants criminal proceedings, including a court martial, for those rogue soldiers who decided to do what they did," he said. "It does not reflect an image of a defence force at all." 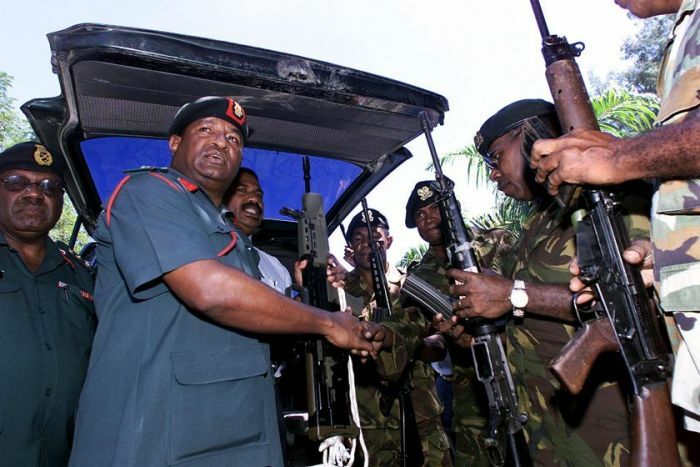 In the incident, armed soldiers broke down the gates to the Port Moresby General Hospital and began attacking people. He condemned the soldiers for attacking "the very people they have sworn to protect and defend". The attack at the Port Moresby General Hospital happened just hours before Australian Prime Minister Kevin Rudd arrived in the capital for talks with PNG counterpart Peter O'Neill. While in Port Moresby, Mr Rudd announced a plan to send 50 Australian Federal Police officers to PNG by the end of the year to help tackle law and order problems.